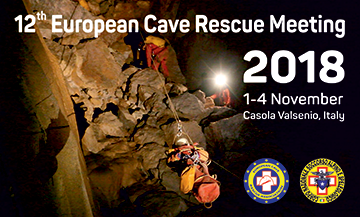 Cave-Rescue Commission is an expert Commission of the Croatian Mountain Rescue Service and its main mission is performing rescues from underground objects (caves, pits, mines …). Ever since its foundation, in 1950, the Croatian Mountain Rescue Service (earlier Mountain Rescue Service) has been also successfully performing cave-rescues. By discovery of new large vertical pits on North Velebit, during 1990s, new requirements in the discipline of rescue have risen, which resulted in formation of special Sub-commission by CMRS in January 2001. It was later named Cave-Rescue Commission. So far, in Croatia, there are approximately 9000 known caves of various morphology, which demand specific interventions during rescue missions. – Long and complicated siphons (Majerovo Vrelo, 942 m long and 104 m deep). Performing rescues in these conditions requires top organization, large number of qualified and trained speleo-rescuers, large amount of specialist equipment and good logistic support considering the possibility of dealing with complicated rescue missions which could last for several days.